"This is a wonderful time to be living here on earth. Our opportunities are limitless. While there are some things wrong in the world today, there are many things right, such as teachers who teach, ministers who minister, marriages that make it, parents who sacrifice, and friends who help. "We can lift ourselves, and others as well, when we refuse to remain in the realm of negative thought and cultivate within our hearts an attitude of gratitude. If ingratitude be numbered among the serious sins, then gratitude takes its place among the noblest of virtues" (Thomas S. Monson, "An Attitude of Gratitude," Ensign, May 1992, 54). I realized that I hadn't updated the blog recently, so I thought while giving an update, and in the spirit of November and Thanksgiving, I would have an "attitude of gratitude". 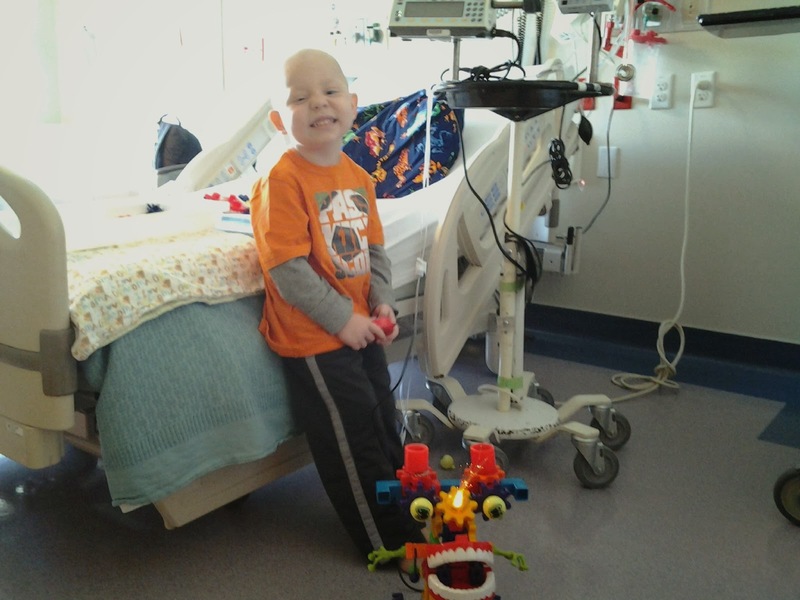 Ethan finished his high dosage ARA-C with flying colors! For those who don't remember, he got very sick with this chemo when he did it the first time, and that was with a much lower dosage. He made it through all 2 weeks with only throwing up once! I can't begin to tell you how relieved and grateful I was. He lost his appetite, and didn't eat much, but for the first time, we actually used room service to order fries, corn, and cookies. He ate about 1 fry each time, but considering he hasn't eaten hardly anything except yogurt and chocolate voluntarily over the last 2 years, this is HUGE progress for him, and I am so grateful for that! I am ALWAYS so grateful for the wonderful techs, nurses, nurse practitioners, childlife specialists, doctors, and everyone else that make our lives just a little bit easier. They are so patient and caring, and most of them have a sense of humor, which helps break up the monotony of the day in/day out of the hospital. They truly care about our children. One day Ethan was struggling being hooked up to the IV pole, and was crying. One of our favorite nurse practitioners, Andrea, was in the room giving me an update on counts, etc. She looked like she might cry she felt so bad for him. She and Ethan get along really well. She tried to comfort him, and made extra time later in the day to stop by and make sure he was doing ok. She always says how much she loves Ethan. We get told all the time by the nurses that they are fighting over who "gets" to take care of Ethan that day. It makes us feel so loved and cared for, and I am so grateful for that! After staying in the hospital for a few weeks, and waiting for Ethan's immune counts to come up, we were at our limit! His counts were going down, and finally they stabilized. On Friday, his counts were still at 0, but he next time they did the test on Sunday, they had made an amazing leap up to 500, which is the magic number to come home! We were all thrilled that he was able to come home earlier than we had thought. Heavenly Father knew we needed to have time as a family, and I am so grateful for that! Now we are in the "wait and see" mode again. Ethan will have a blood test tomorrow to see if his counts are to the point where they can get accurate bone marrow results. If he makes counts, he will be going in on Wednesday for a bone marrow aspirate. We should find out Thursday or Friday if he is in remission. If he is in remission, we will begin the preparations for the bone marrow transplant. If not, he will do some experimental treatments. There is a possibility he will need to leave the state to do experimental treatments. They have 2 treatments at Primary's, but a team across the country will look at his case and decide which treatment they think will work best for him. Please keep him in your prayers that he may be able to be in remission! As always, we are so grateful for our amazing families who have watched kids, brought us food, checked up on us regularly, and has offered to help where needed. We are so grateful for friends and ward members who ask for updates, celebrate with us when we receive good news, and mourn with us when the news it not so good. They have brought us meals twice a week every time we have been inpatient. They have driven my kids to and from school. They have sent gifts to Ethan to help break up the monotony of hospital stay. They have called and talked to me to let me focus on something different than blood counts, cancer, and worry for my family at home. I am so grateful for my family who has been so selfless through all of this. My kids don't mind that Ethan gets a lot of attention. They rejoice with him when he gets a gift, or is able to come home. They are so patient through all of it, even though this is extremely hard for them as well. I am so grateful for a loving husband who does his best to ease my burdens, even though he is dealing with the same trial. Who is willing to do whatever he can to make things easier for me, Ethan, and the rest of the kids. I am so grateful for Ethan who has taught us to be strong, never give up, and face life and trials with an amazing attitude. Last and most important, and I grateful to my Heavenly Father for giving me all of these blessings. For helping me stand. For answering my prayers when I am not sure I can make it through another day. I am grateful for my Savior who suffered for the burdens that I carry so that I don't have to carry them alone. Here are a few fun pictures from the last few weeks! Off to the hospital! Mickey Mouse is buckled in next to Ethan! 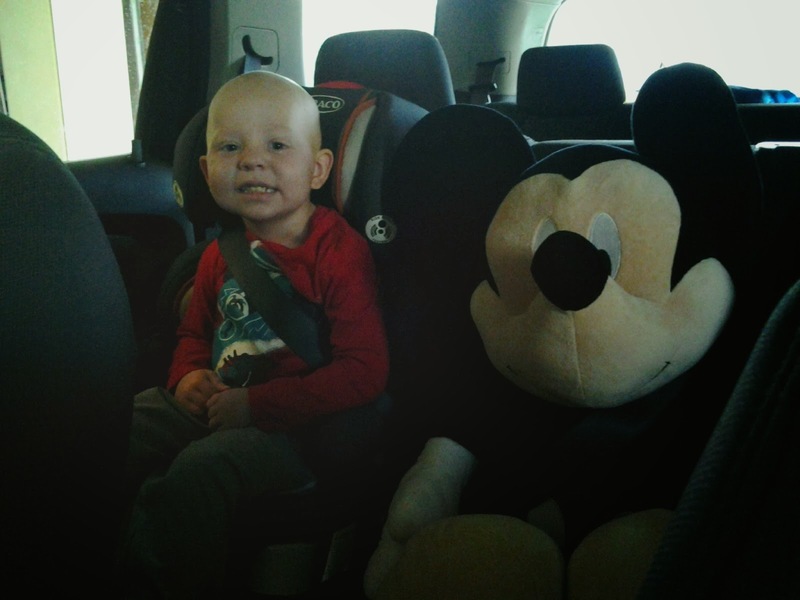 A ward member got Ethan this GIANT Mickey Mouse. 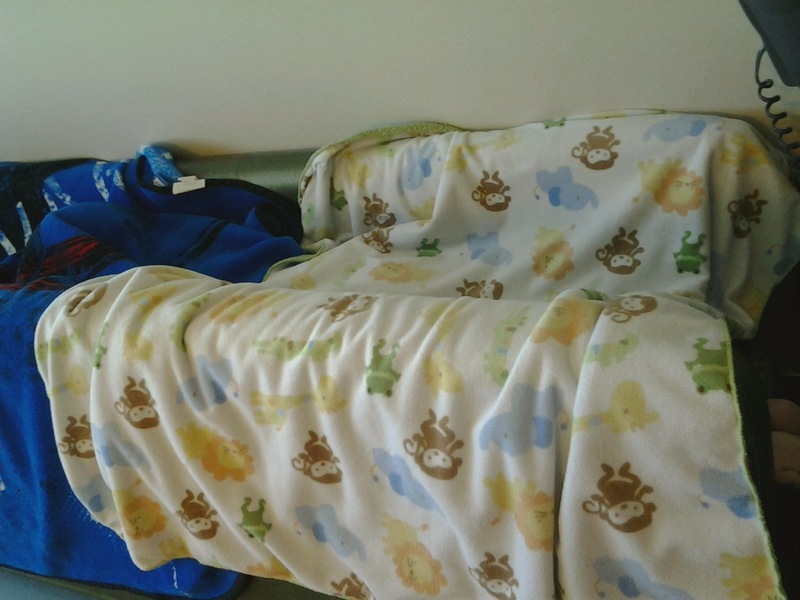 He was Ethan's pal throughout his hospital stay. When I would leave the room, he would frequently say, "Well, and least I have a friend with me, Mickey Mouse"! Pet Therapy dogs are always fun! 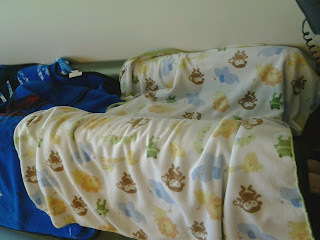 This is Ethan's fort he made out of the couch at the hospital and his blankets. He would lay inside of it and watch Mickey Mouse on his iPad! A friend let us borrow her fun toys, and Ethan made a creation! Physical therapy brought a trampoline to play on! Hello! You probably don't know me, but we're cousins :) I am Lynn & Calleen Hall's daughter. I have just finished reading all your posts about Ethan and have been thoroughly inspired and uplifted by your amazing spirit and testimony. Little Ethan amazes me with all he has been through, yet still smiles. I have seen updates previously through other family members, and though we don't know you personally we have thought about your family and prayed for you. I also have a 3-year-old boy and can't begin to imagine the difficulties you have had to deal with, but I am impressed with your positive attitude and feelings of gratitude expressed here. You are an amazing example and we will continue praying for all of you, especially Ethan.